The inferior olivary nucleus, also called inferior olive, is the largest nucleus situated in the olivary body, part of the medulla oblongata. It is involved in motor control. It is a major source of input to the cerebellum. The hypoglossal nucleus sends its fibers ventrally between the pyramid and inferior olivary nucleus to exit as the hypoglossal nerve. 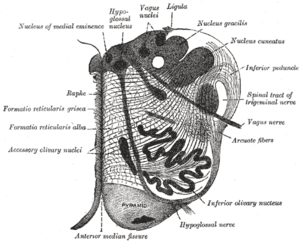 The inferior olivary nucleus consists of a gray folded lamina arranged in the form of an incomplete capsule, opening medially by an aperture called the hilum. Olivocerebellar fibers are neurons that have their cell bodies in the inferior olivary nucleus. Their axons leave medially through the hilum, cross the midline, and ascend into the cerebellum via the inferior cerebellar peduncle. Once they enter the cerebellum, they are referred to as the climbing fibers. Finally, they terminate by synapsing in the cerebellar cortex, including the cortex of the vermis, paramedian lobule, and the cerebellar hemispheres. The fibers leaving the inferior olivary nucleus at the hilum may be referred to as the "peduncle" of the olive. They cross with those from the opposite olive in the raphe. After the raphe, they may be referred to as the internal arcuate fibers. The fibers are smaller than the internal arcuate fibers connected with the medial lemniscus. Important connections between the cerebrum and the olive of the same side exist, but the exact pathway is unknown. Many collaterals from the reticular formation and from the pyramids enter the inferior olivary nucleus. It is closely associated with the cerebellum, meaning that it is involved in control and coordination of movements, sensory processing and cognitive tasks likely by encoding the timing of sensory input independently of attention or awareness . Lesions to the inferior olive have been associated with a decreased ability to perfect highly specialized motor tasks, such as improving one's accuracy in hitting a target with a ball. There is some evidence that it is stimulated by ghrelin. Hypertrophy has been associated with progressive supranuclear palsy. Removal of one cerebellar hemisphere is followed by atrophy of the opposite olivary nucleus. 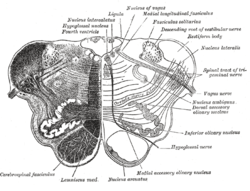 Section of the medulla oblongata at about the middle of the olive. 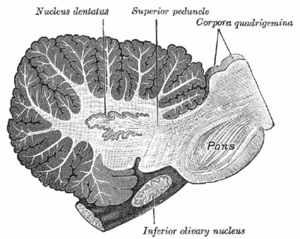 Sagittal section through right cerebellar hemisphere. The right olive has also been cut sagittally. 1 2 3 4 Gado, Thomas A. Woolsey ; Joseph Hanaway ; Mokhtar H. (2003). The brain atlas a visual guide to the human central nervous system (2nd ed.). Hoboken, NJ: Wiley. p. 206. ISBN 0-471-43058-7. ↑ Xu D, Liu T, Ashe J, Bushara KO. 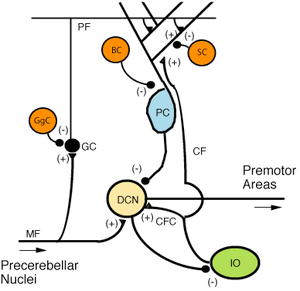 Role of the olivo-cerebellar system in timing. J Neurosci 2006; 26: 5990-5. ↑ Liu T, Xu D, Ashe J, Bushara K. Specificity of inferior olive response to stimulus timing. J Neurophysiol 2008; 100: 1557-61. ↑ Wu X, Ashe J, Bushara KO. Role of olivocerebellar system in timing without awareness. Proc Natl Acad Sci U S A 2011. ↑ Martin TA, Keating JG, Goodkin HP, Bastian AJ, Thach WT. Throwing while looking through prisms. I. Focal olivocerebellar lesions impair adaptation. 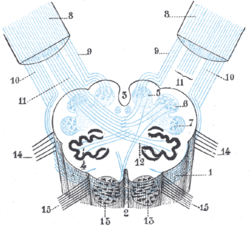 Brain 1996; 119: 1183-1198. ↑ Zhang W, Lin TR, Hu Y, Fan Y, Zhao L, Mulholland MW (2003). "Activation of c-fos expression in the rat inferior olivary nucleus by ghrelin". Neurosci. Lett. 353 (3): 157–60. doi:10.1016/j.neulet.2003.08.083. PMID 14665405. ↑ Hanihara T, Amano N, Takahashi T, Itoh Y, Yagishita S (1998). "Hypertrophy of the inferior olivary nucleus in patients with progressive supranuclear palsy". Eur. Neurol. 39 (2): 97–102. doi:10.1159/000007915. PMID 9520070.